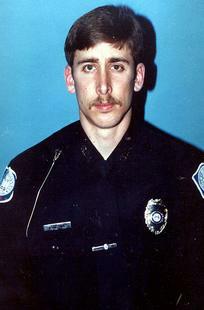 Officer Mark Allen MacPhail, Sr. Officer Mark MacPhail was shot and killed while working an off duty security job at a bus station. He was shot when he responded to the cries of a homeless man who was being robbed and pistol-whipped. The robber shot Officer MacPhail underneath his vest and then again in the head as he fell. The subject was sentenced to death and executed on September 21, 2011, twenty-two years after his conviction. Officer MacPhail was a U.S. Army veteran and had served with the Savannah Police Department for three years. He is survived by his wife, 1-year-old daughter, infant son, mother, and siblings, and is buried in Hillcrest Abbey West Cemetery, Savannah, Georgia.